Meanwhile, back on the farm… Gabriel Caplett surfaced in Northern Michigan. 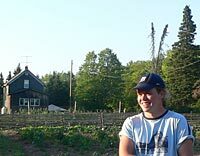 He’s not only busy with naturally grown vegetables, but also engaged in other environmental projects. Thanks to podcasting, we can still hear him making music… Live from the Upper Peninsula, Marquette, Michigan: Gabriel Caplett!